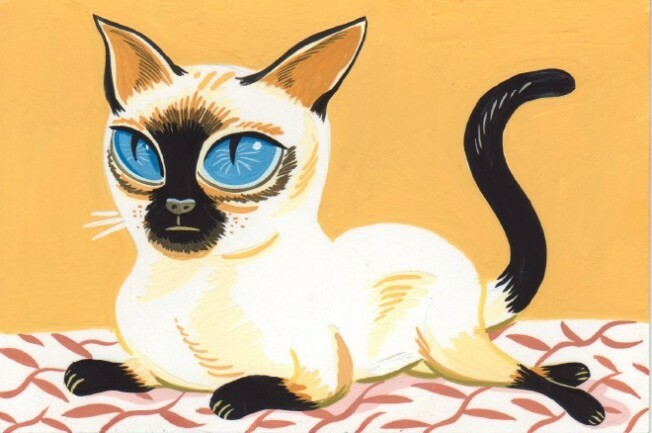 Meow meow -- this little kitty scratches our itch for lively art that is a snap to own. See small 'n pretty pieces at the Itty Bitty Art Sale, on Sunday, February 8. We're starting to feel a bit like Alice as we grow larger -- or seem to -- while everything around us shrinks a bit, day by day (our closets, our change jars). But that's okay; we do believe that a pared-down life can be a satisfactory life indeed. Plus, that's where things are headed, and we're never ones to rock the proverbial boat, or shake the peach tree, or shimmy while everyone around us shakes. And talk about even unexpected things going down the pared-down path: The Itty Bitty Art Sale is devoted to works that pack a punch in just a sliver of space. And at just a sliver of a price, too. The 250 works available through the sale are tagged at $35 a pop. As in, seven $5 bills. Pack yourself a couple of lunches next week and spend that dough on a pretty painting you'll have on your wall forever. A few other things to know going in. You'll find out who the artist is after you purchase (we can grok to that). Several starry names will be behind the works -- Ashley Tisdale and Ed Helms are two of contributors on the big, big artist list -- so many surprises await purchasers. And the artworks? Postcard-ish size. Perfection.